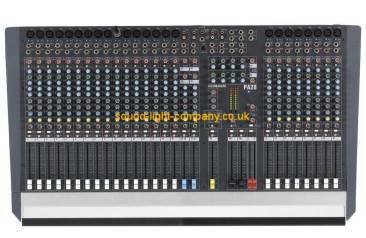 The PA20 is a robust, compact 20 input (16 mono, 2 dual stereo) mixer with a straightforward layout and extensive functionality. With a design and build quality that mirrors our professional touring desks, PA20 is an essential addition to any band, school, theatre, or hire inventory. The main XLR outputs derive their source from a selectable combination of LR (stereo), L+R (mono), FB1 and FB2, and provide master level trim, meters, slave outputs, patch point for external processors, and the very precise 4 band semi-parametric equalisers. This is extremely flexible and means that the PA can be operated in many different ways. For example, the user may want to run a stereo house system with separate left and right speakers and no monitors, or a mono system with a foldback monitor. Each mono input channel is equipped with a 100Hz high-pass filter, an invaluable tool for cleaning up the mix. The majority of live sound sources have very little content below 100Hz, and modern microphones have wide frequency response and can pick up bleed from nearby low frequency sources such as bass and kick drums. The filter can be used: on vocal channels to reduce mic handling noise and close proximity 'popping' on drum overhead mics to reduce kick and bass pick up; on higher frequency instruments such as flute and acoustic guitar; and on stage mics to reduce foot noise. The 4 band input EQ is every bit a pro tool. The low [60Hz] and high [12kHz] bands have shelving response, while the high-midrange band is sweepable from 350Hz to 6 kHz. Low-midrange EQ has a bell response at 250Hz – a frequency chosen to provide reduction of 'muddy' sounds and enhance 'warmth'.